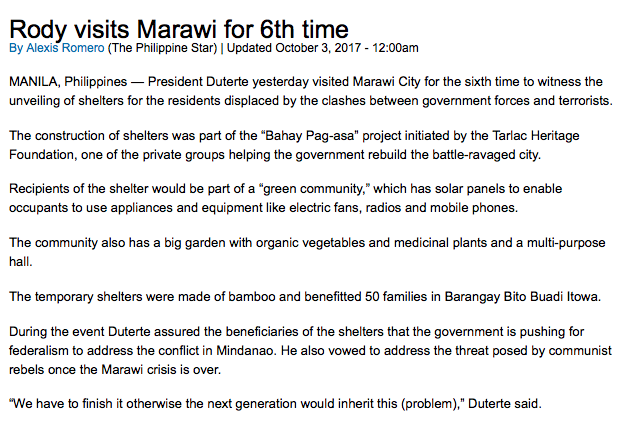 Duterte made his 6th visit to Marawi at the beginning of the week. 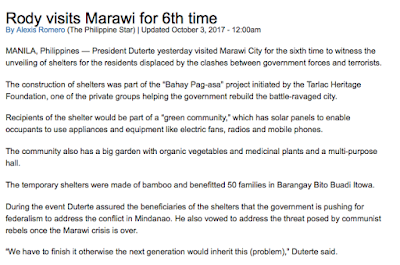 President Duterte yesterday visited Marawi City for the sixth time to witness the unveiling of shelters for the residents displaced by the clashes between government forces and terrorists. During the event Duterte assured the beneficiaries of the shelters that the government is pushing for federalism to address the conflict in Mindanao. He also vowed to address the threat posed by communist rebels once the Marawi crisis is over. 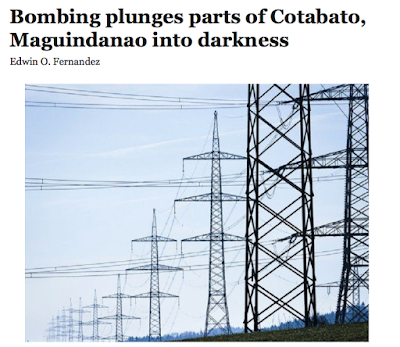 “We have to finish it otherwise the next generation would inherit this (problem),” Duterte said. 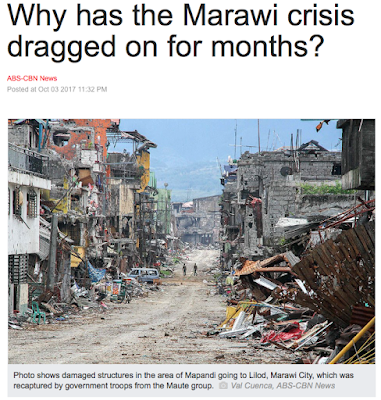 Does Duterte really think that federalism will solve the terrorist problem? Like the Philippines will implement federalism and the communists and ISLAMIC terrorists will suddenly throw down their arms? 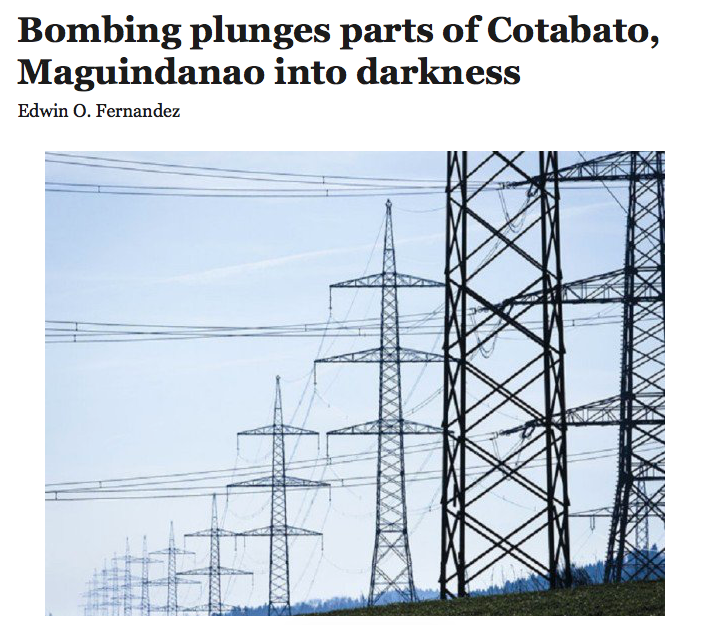 Do the people who bombed out the power grid in Cotobato really care about federalism? 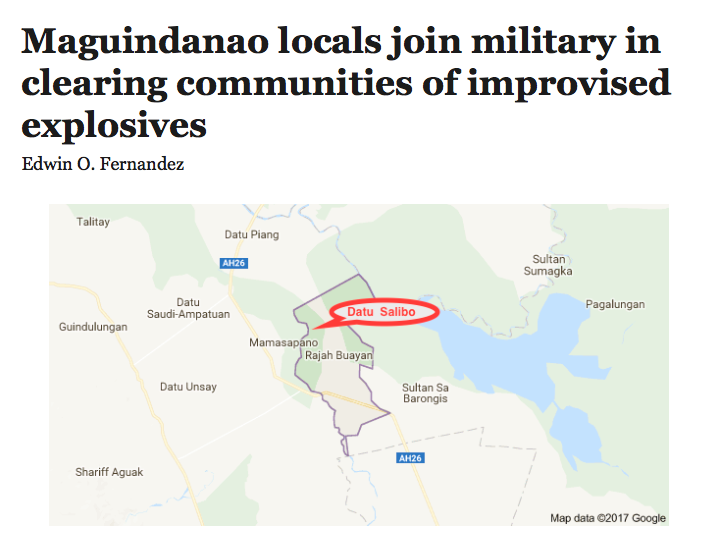 Maguindanao is shaping up to be a real bad area. 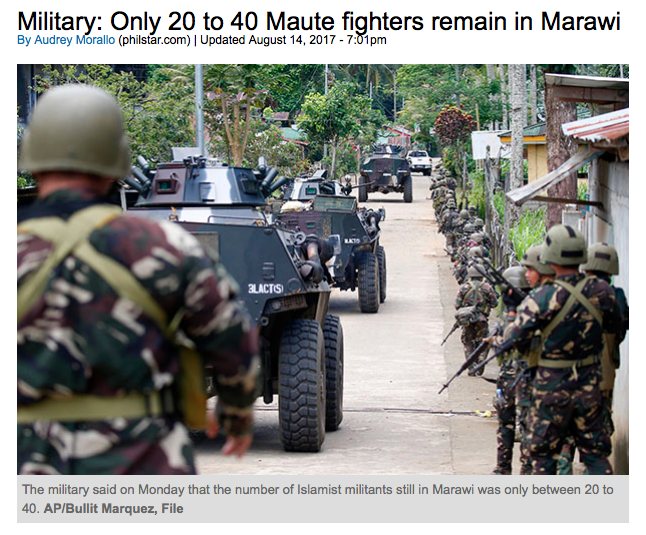 Likely the next epicentre of combat after the Battle of Marawi ends. And the communists are stirring up trouble as well. Will federalism make them exchange their weapons for plowshares? Can the AFP handle a war on so many fronts? 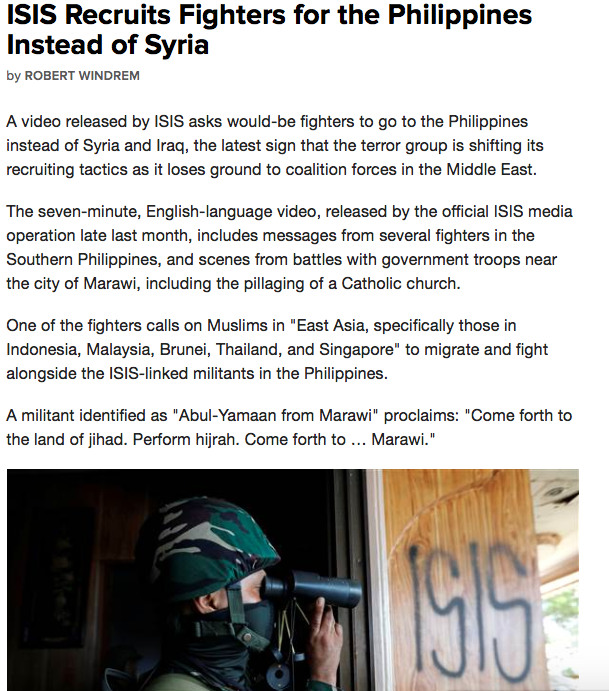 The ISLAMIC terorirsts and the communists don't care what system of government the Philippines implements. They are at war with the Philippines regardless. They both want a piece of land for themselves. Even the declaration of martial law in Mindanao has left some folks unfazed. Martial law? Who cares! Especially when there aren't enough troops to enforce it. 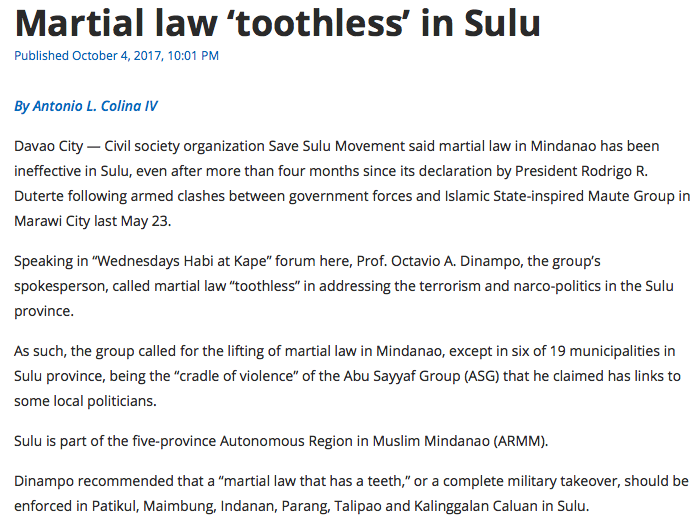 Civil society organization Save Sulu Movement said martial law in Mindanao has been ineffective in Sulu, even after more than four months since its declaration by President Rodrigo R. Duterte following armed clashes between government forces and Islamic State-inspired Maute Group in Marawi City last May 23. 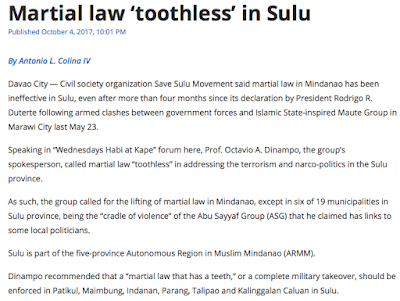 “Despite the declaration of martial law, despite having Napolcom, cancelling deputation of PNP by local politicians, (there are still) criminal activities or partnership in the province of Sulu, but nothing much has been done. There was arrest here and there, killing of one or two ASG here, but in its entirety I think we did not achieve the purpose it serves,” he said. The war in Marawi has dragged on for longer than it should have. Why? 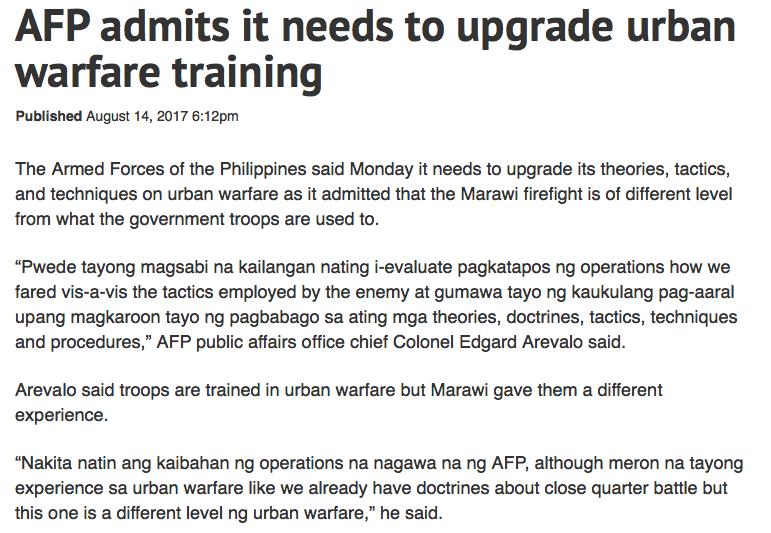 Duterte thinks the AFP could learn lessons from the Battle of Mosul. Duterte said there might be a need to revisit military doctrines to address the threats posed by terrorism. “Eh parang nahihirapan ho tayo dito (It seems that we are having a hard time). 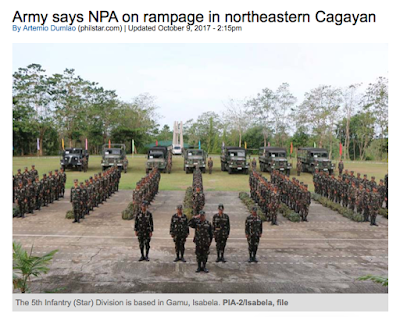 We have to revise the doctrines actually because we are facing an enemy that is well entrenched and it is an urban fighting,” the president told Army troops in Fort Bonifacio. “It took us this long because the terrain has changed considerably. Maybe you’d want to take a look at seriously how Mosul, Aleppo and the rest of the territories are being taken now and how long it has been for them to do it,” he added. For the moment let's overlook the fact that Duterte has no idea what he is talking about as evidenced by his reference to Aleppo, the capital of Syria, which was never occupied by ISIS terrorists. 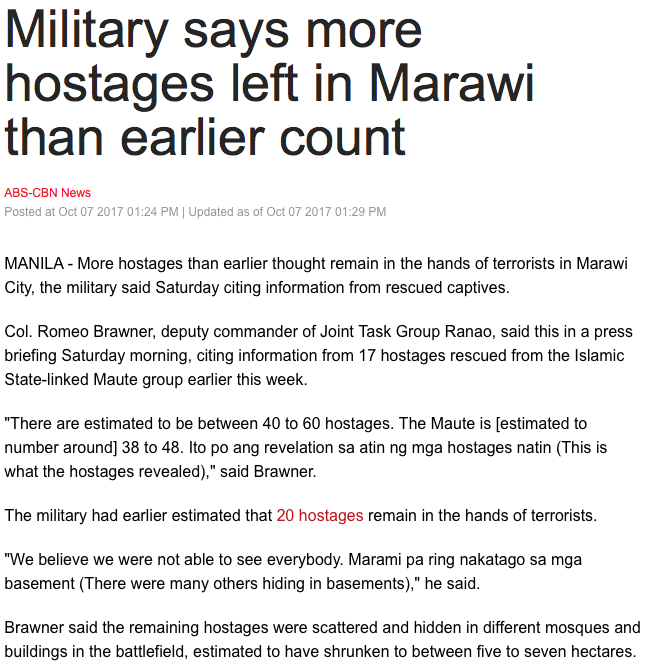 Mosul and Marawi are not really comparable. The Battle of Mosul was comprised of a highly skilled and well equipped international coalition of about 108,000 troops versus approximately 12,000 ISIS terrorists in a battle which lasted 9 months. 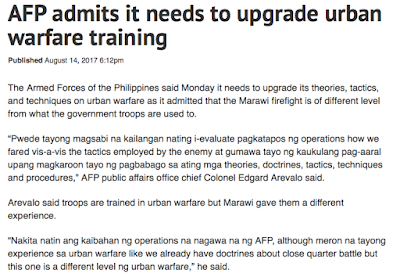 The Battle of Marawi is being fought by approximately 6,000 AFP soldiers plus PNP officers who are both unprepared and not well equipped versus less than 1,000 ISIS terrorists who were allowed to stockpile arms for quite some time before the battle began. The numbers aren't even close. What's more the preparedness is not even close. US-trained Iraqi troops were prepared for urban warfare against ISIS. 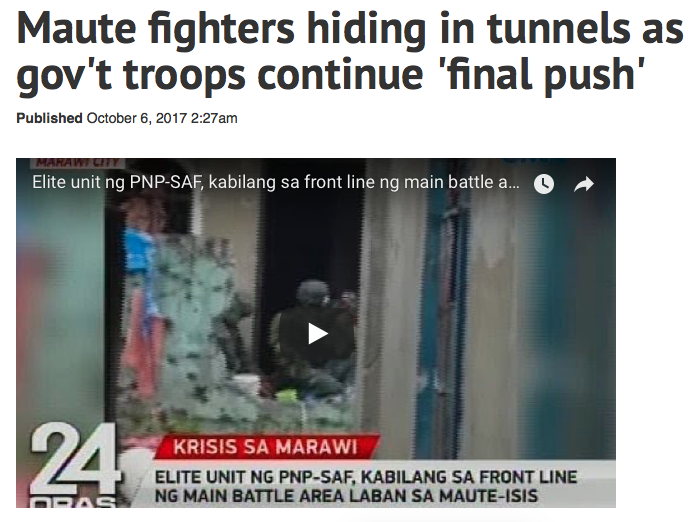 The AFP was not. 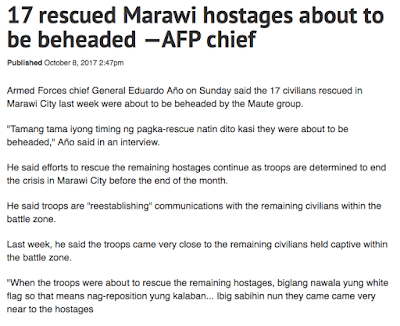 The AFP can deflect from their unpreparedness and say that the reason the battle is taking so long is because they are wanting save the lives of hostages but that is only half the story. Remember they were going hard at it until the Supreme Court declared martial law constitutional. It was only then that Duterte gave the order to slow down using the hostages as an excuse. Remember when he told the AFP not to worry about killing civilians, i.e. hostages, because it's a war zone and that kind of thing happens? Col. Romeo Brawner, deputy commander of Joint Task Group Ranao, said Tuesday that the siege dragged on due to difficulties in clearing the conflict zone. "The reason why it is taking a bit longer than we expected is because foremost among our objectives is to ensure the safety of our hostages," he said on ANC's "Beyond Politics". 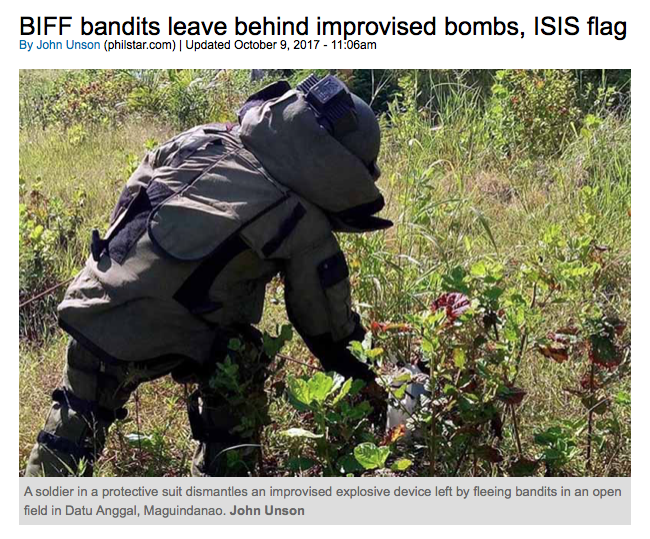 "While our forces are moving forward, they have to be really cautious so that the hostages will not be caught in the firefight and also so that we’ll be able to clear the IEDs and this will not cause unnecessary casualties on the government side," he added. 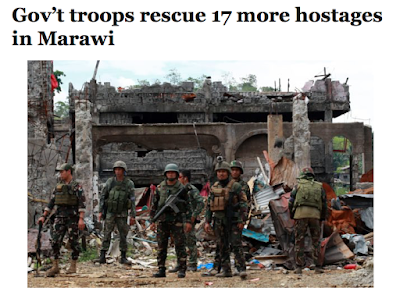 This week a goodly number of hostages have been rescued. 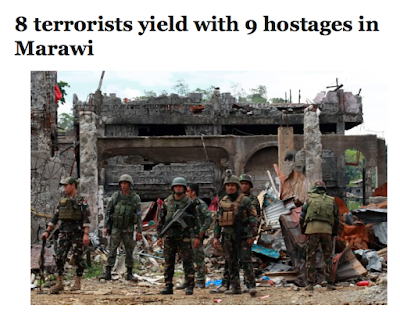 So that's 26 hostages rescued and 8 terrorists who have surrendered. Plus all the other dead terroriists this week means there are significantly less enemy combatants. 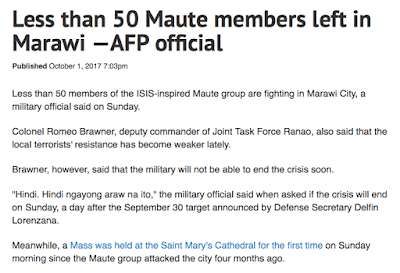 Less than 50 Maute members left? Good job! Excellent! Way to go! But wait a minute. 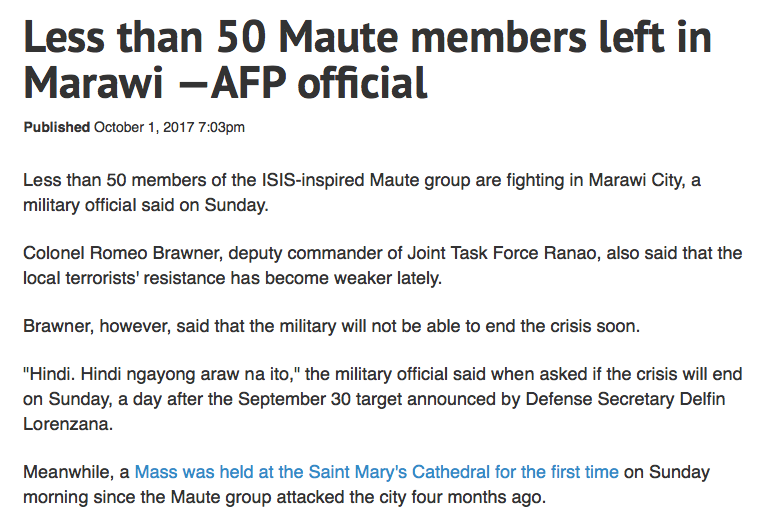 Two months ago there was also less than 50 Maute members left. How can the same amount of enemy combatants still remain after two months? These numbers don't add up. 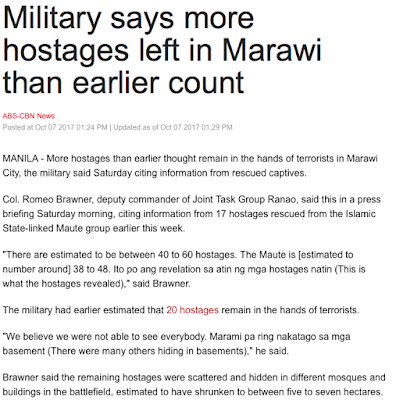 That's because the AFP does not know how many terrorists are left. They are guessing. Are they also guessing about the remaining number of hostages? "There are estimated to be between 40 to 60 hostages. The Maute is [estimated to number around] 38 to 48. 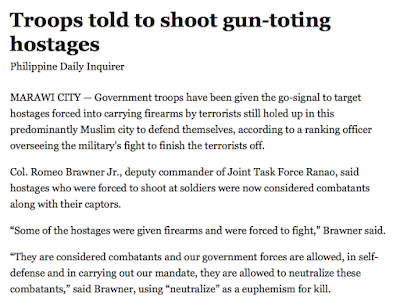 Ito po ang revelation sa atin ng mga hostages natin (This is what the hostages revealed)," said Brawner. 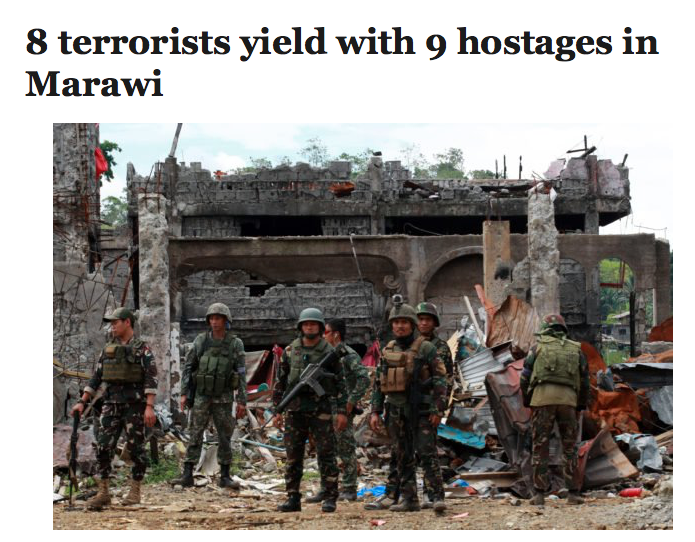 The military had earlier estimated that 20 hostages remain in the hands of terrorists. Yeah they are guessing. Nothing wrong with guessing but maybe they could keep it to themselves and tell the media either they do not know or no comment. 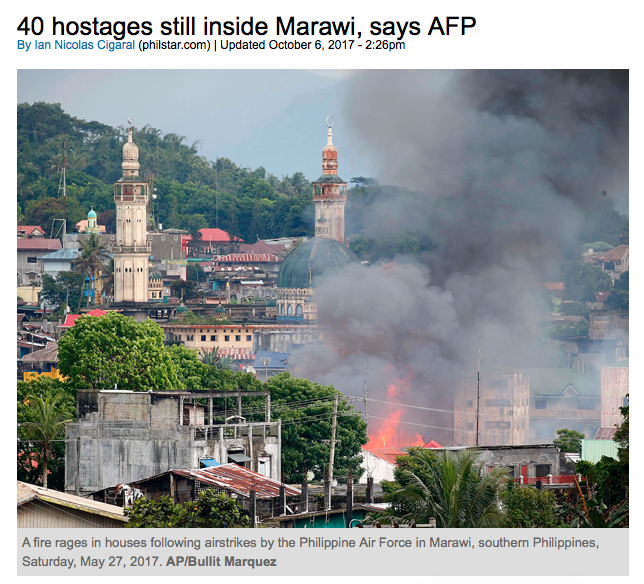 If they are concerned about rescuing hostages then the AFP had better put their noses to the ground and rescue them since they remain in immediate danger. 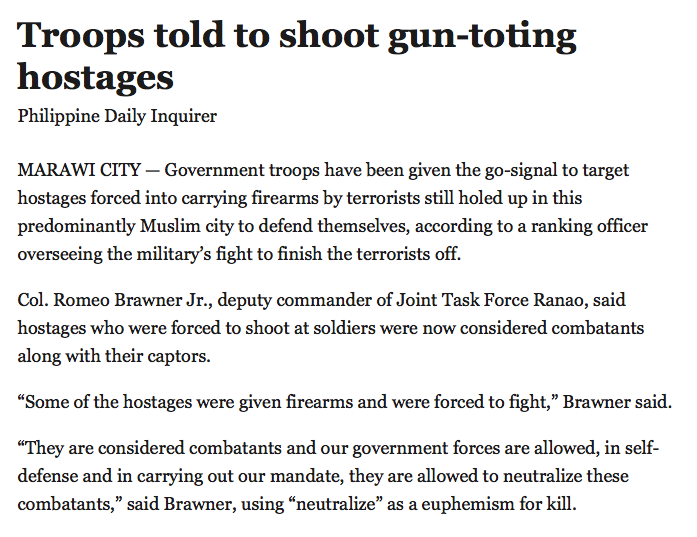 These hostages are not only in danger from their MUSLIM captors but also from the AFP which has given shoot to kill orders for anyone seen with a weapon. Even hostages! 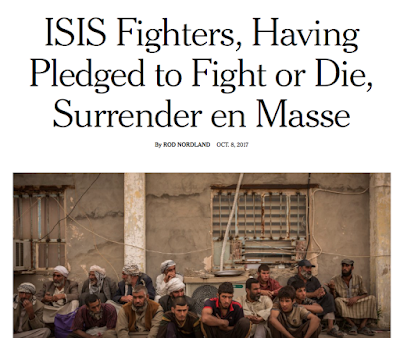 The few days of battle left will no doubt be hard fought as the ISLAMIC terrorists use every tactic they can in a fight to the death. The military said the remaining members of the militant group have opted to hide in underground tunnels. 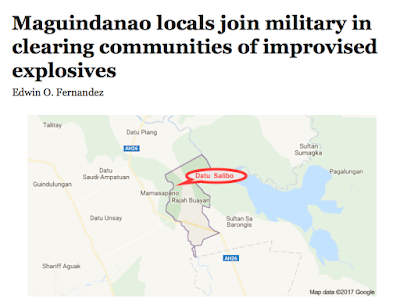 Moreover, the government had yet to retake six hectares of the main battle area, wherein terrorists have planted improvised explosive devices. Next Sunday is October 15th. Will the AFP meet their self-imposed deadline and have finished the battle by then? 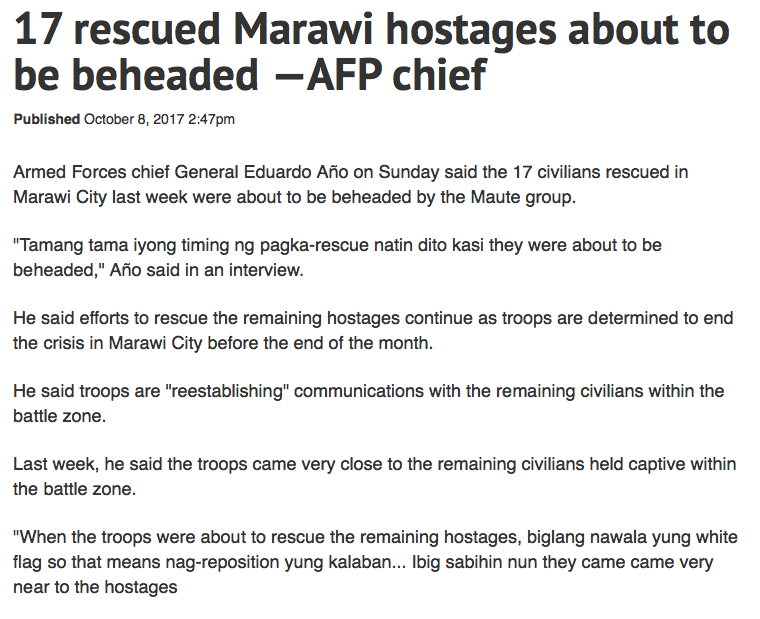 Will the AFP kill every last terrorist or will Maute surrender like their comrades in the Middle East? Will the end of the Battle of Marawi be the end of ISIS in the Philippines? 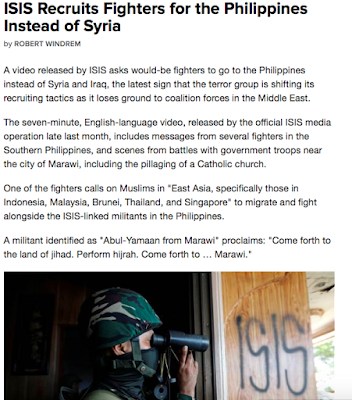 On the contrary there are indications that while ISIS is losing in the Middle East, SEA and particularly the Philippines is quickly becoming the next front in the global war on terror. 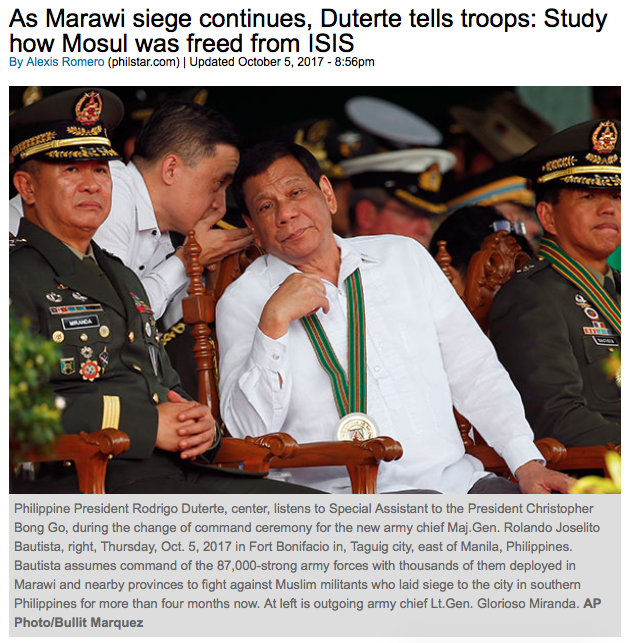 It could be that Duterte's renewed friendliness with the USA will be the key that begins to unlock the chains of ISLAMIC terrorism which are quickly tightening their grip on the Philippines and the region.